WARNING – The following post contains considerable writer geek-speak, and may cause non-writing enthusiasts’ eyes to glaze over. DO NOT OPERATE HEAVY EQUIPMENT FOR AT LEAST HALF AN HOUR AFTER READING THIS POST. If you are easily offended by geek-speak, please do not read any further. This is a sort of followup to my post from February 15 (In answer to Mike’s question…) in which Mike wanted specific sales numbers from when I put HPM up for free. In that post, I explored what happened during “The Great Experiment” from the perspective of using Amazon’s KDP Select “free” marketing tool. Well, this post is about another marketing tool I just used — paid advertising. Yes, I actually paid for an ad for my book. I once again had some great guidance from my fellow Red Adept Select authors in chosing the proper ad. Truth be told, I sat back and let them decide what ad location would be best, and I went along for the ride. And what a ride it was. There was a short list of sites that most of them felt would be worthwhile with regards to buying ad space. You have to balance several factors: the readership or traffic on the site, the cost of the ad space, the length of time the ad will run, and probably a few others I can’t think of at the moment. You may also run into problems with some of the more reputable sites with actually getting in. Some have relatively strict requirements and considerable waiting lists. 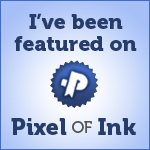 The site I got on is called Pixel of Ink. POI is a little expensive (I think it was $275, but I could be wrong), a bit restrictive (requires that the book have at least ten four-star or five-star reviews on Amazon), and has a HUGE following. I paid for my ad last December, and it just came out on February 24. When I just went to their site to check specific requirements (I don’t actually remember them all), the site shows that they are closed to further submissions. I can only assume this is because they have already filled their slots for the current time period (quarter? year?). So, the ad for HPM came out shortly after 2PM on Friday, February 24th. As soon as I saw that the ad was out, I struck a base line on my sales and started tracking hourly (yes, I’m that kind of geek) See the chart over there to the left? (Click on it if you want a larger view.) 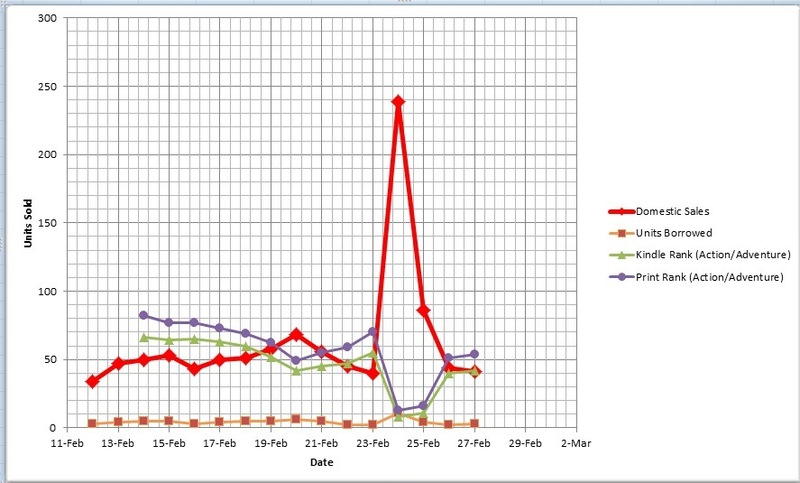 Notice that at the beginning of the chart the unit sales per day were dancing around the fifty sales per day line. That big spike there? Yep, that’s the day of the POI ad. 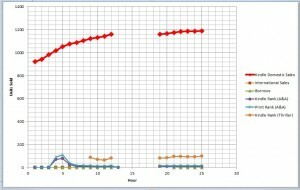 As you can see, I began charting from my 2PM baseline (Row 2 – 2-24 1400) with “1400” representing the time. It was easier to keep the columns sequenced properly using military time. There are some obvious observations here. 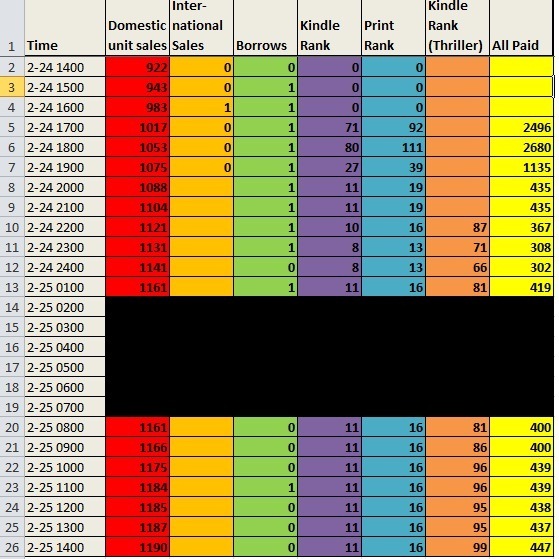 For instance, note that as the number of Domestic Sales (red column) increases, the various rankings on Amazon decrease (they don’t show up until row 5 because that was when HPM broke into the top 100). This inverse relationship is shown even more obviously in the earlier chart. You will see that when that huge red spike of Domestic sales goes up, the other lines (representing the various rankings) goes down. The exception is the lowest line at the bottom, which represents the number of units borrowed in the Kindle Prime library. Note also that at 10PM (Row 10), HPM unexpectedly broke into the Top 100 Kindle Sales in a whole new category, (Thriller). I’m not honestly sure what prompted that, but I’ll take it. But something that’s not quite as obvious, and in fact might actually be mistaken for a discrepancy between the two sets of numbers, is the fact that the first chart shows 239 domestic sales, while the second shows 268. This is explained by taking into account the two different timeframes. 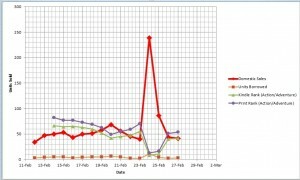 The first chart covers the period of 8AM, February 24th, to 8AM February 25th. But the POI ad came out at 2PM, so when I tracked for a twenty-four hour period, I covered from 2PM of the 24th to 2PM on the 25th. That covers more of the “hot” period after the ad. Here is another chart that exclusively covers that time period. This picture is simply a graphical representation of the same data shown in the spreadsheet above. In this one, the relationships between the trends is more difficult to see because the scales are so disparate. 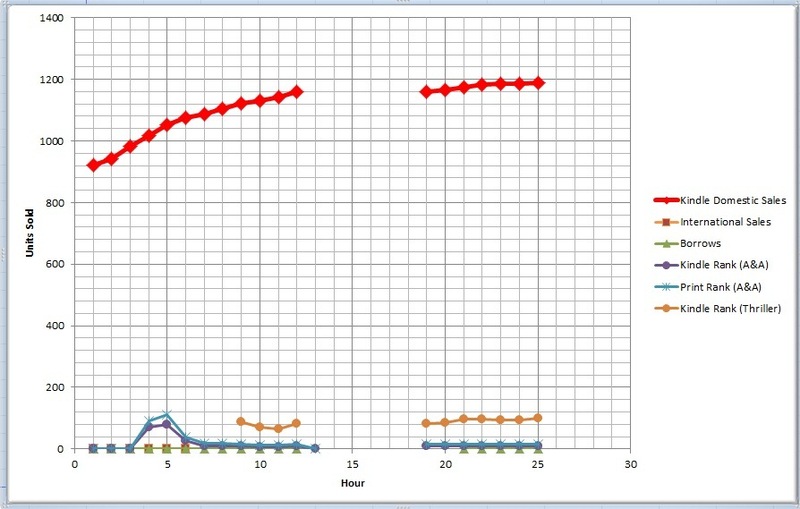 Nevertheless, these two graphics show that, rather than the 239 sales indicated on the 8AM to 8AM chart, there were actually 268 sales for the twenty-four hours immediately following the POI ad. There were also 11 borrows during that same time period, when there are typically only three or four per day. It looks like my peak rankings were right at midnight, when I hit #8 in Paid Kindle A&A, #13 Paid Book A&A, #66 Paid Book Thriller, and #302 in All Paid Kindle Books. And right now, it’s 8AM February 29, five days later. Checking my numbers shows HPM is still in the top 100 A&A in both Kindle and Book categories (#62 and #79, respectively). It is also #2149 in all Paid in Kindle Store. So was my ad purchase on POI a success? Absolutely. Is it going to work like this every time for everyone? Of course not. Buying the ad alone is not going to guarantee sales. There are your basic prerequisites here. You have to have at least a marginally well told story. That story must be well-edited (hire a good editor folks – it is a necessary investment in this business). You have to have decent packaging (a good cover and title is also necessary – if you can’t do the cover yourself, hire someone). THEN worry about promotion. If you’ve done all this, and you still have some cash to gamble – because it is a gamble – then you can think about purchasing advertising. Now, for all of you who couldn’t care less about my lessons along the way to learning the business of writing in today’s market, I promise to have something less geeky/writer-y to post in the next few days. In the meantime, be safe everyone. Very interesting stuff Jeff. It seems that most of your reviews are positive. I don’t agree with Traveller’s critique of you plots not taking time to develop, and it being edited to the bone. The pace of your story, to me, clicks very well. I cannot imagine how to draw out the beginning and the discovery of Leeland’s father’s death. I mean how long does it take even for the most uninformed person to realize that Houston just had a nuclear “event”. All the meat is gone.In this book the main character figures out far too quickly what has happened. There’s a few paragraphs and wham, he knows exactly whats happened and what to do about it. His spelling could use some help but aside from that, how do you NOT know that a fireball in the sky, the loss of all utilities, and the deafening roar from the explosion that something is wrong? Dragging the discovery that “Houston we have a problem!” and the fact that his father’s pace maker was disabled by the EM pulse, to me, would have been a disservice to the story. I mean Leeland is in the dark, literally, in his workshop and the story builds from that point on. I suppose he could have sat and read his Kindle for a couple of hours waiting for the power to come back on, and THEN discover that we’ve been nuked and that rotting smell coming from the front office is his dead father! I think the pace for the story is a good clip. It develops nicely and keeps the reader engrossed in the action. Of course each to his own and I suppose if you like novels like War and Peace, then any other story just doesn’t have enough “meat on the bone”! For me, it’s a wonderful story for a first time writer, very professionally done! Can’t wait for the next projects. Thanks for the support, Barry. While I obviously don’t agree with everything that he said, he does have some valid points. I’m under no illusions that HPM is anywhere close to perfect. It’s my first novel, it’s completed, and I’ve put it behind me in order to work on the next projects. I can’t afford to obsess about each review it gets. And while I admit that it bums me out a little when I get a poor review, I can take a certain measure of comfort in the knowledge that there are more people who like it than not. My goal is to learn a little from each project, and each review – and continue to put out as good a product to the reader as I can. If I do that, then (hopefully) each story I tell should get a little better. As it is right now, I have some people who like the results so far, and some who don’t – and I’m okay with that. I can accept that I’ll never be able to please everyone. All I can do is strive to improve my craft. I actually got your book free the day it was on Kindle for free. Oddly enough, the way I found it was through Pixel of Ink. I get a daily email telling me what books are free that day. I am seriously looking forward to another book in this series, and am glad that you are working on one. I can’t wait for the next. Thanks for sharing all the info you do. Very interesting, Jeff. Sadly, right now POI isn’t accepting new ads right now. Hopefully when my book comes out, they will be. Anything I can do to increase exposure and sales, I’ll do. There are other sites like POI out there. Perhaps not with the same level of traffic, but there are others. I have another ad coming out on Wednesday in Kindle Nation Daily. I’ve heard that their ads used to be just as good as POI, but that more people are reporting poor results. Like I said though, I realize this is all a gamble. The way I look at it, my POI ad paid off enough that I have the KND ad already covered. If you’re interested in reading about what gave me the absolute best results as a marketing tool, read about my “ Great Experiment“. Now, I don’t recommend you do this quite yet. You’ll probably want to at least get a few weeks of sales before you decide if you want to go this route. But I went from 86 sales in two weeks to several hundred in the next few – not to mention getting the additional exposure to 11,460 other users, as well as the few hundred others who borrowed the book through the Kindle Prime library. I’m actually beginning to learn a lot about this marketing stuff, but as Terry is fond of saying – the best marketing tool is the publication of your next book (something you’ll be able to “experiment” with soon). Looks like things are still going well for you. There’s a couple of things I’ve been thinking about as far as ads go, and I was curious what you thought. My first thought (and I apologize for being negative) is what percentage of the people who bought your book because of the ad would have eventually bought the book anyway–even if it was over the course of the next year. My guess is it’s not that high, but let’s say, for example, of your 268 sales, 200 of them were a result of the ad, but only 50% of them were sales to people who would have otherwise never bought your book. That’s a net of 100 sales from the ad–not enough to recoup your investment. On the flip side, every sale that’s generated by the ad has the potential to spawn more sales. So if 100% of the sales that wouldn’t have otherwise happened generate each generate another sale that wouldn’t have happened, you’re back in the black. It’s probably impossible to ever determine any real numbers on this, and all the ones I used are probably grossly inflated (I do figure the smaller your niche is, the larger these percentages might be), but I’m just trying to cover all possible scenarios. Thanks for dropping in, Vish. Funny, after all the numbers and charts, I didn’t think of it in terms of units sales per month until you mentioned it. I suppose I have a bad tendency to think in a smaller scale. I know I’ve had some fellow writers tell me this in the past. LOL. As for other sites, the big ones that I know of are Pixel of Ink, Kindle News Daily, and Ereader News Daily. You can also watch on Twitter to see what other sites do Tweets about bargain books. I’m sure there are many others, but I’m too new at the business to know all the ropes yet.